Will The Treasury Yields Dive Even Further? The current situation is similar to the second half of 2000 and that of 2006, when the Fed stopped raising the interest rates. Treasury yields are going to drop further, with a more inverted yield curve. Compared to the previous two recessions, this dive would possibly last much longer, as the room for conventional monetary policy (e.g. rate cuts) is limited. This is a billion-dollar question for investors, and the answer lies in how the economy works. Ray Dalio, the founder of the world’s largest hedge fund, argues that the economy keeps expanding thanks to productivity growth, and the short-term and long-term debt cycles cause swing around the productivity uptrend. The cycle works like this: on the upswing, credit boosts economic growth. But there are limits to debt, and the process reverses when debt can no longer be raised relative to incomes. How does this matter to investors? The key word here is “cycle”. “Cycle” indicates a repetitious and possibly unavoidable pattern, suggesting that the future can be predicted to a certain extent - but only if we know where we are. So, where are we? If we look at the credit cycles over the last two decades, the current situation is similar to the second half of 2000 and that of 2006. Those were the times when the Fed stopped raising the interest rates. Just now, on 20 March 2019, the Fed left interest rates unchanged and dialled back the projections for further rate hikes in 2019. Although the Fed also signals one hike in 2020, history tells us that it is unlikely to be the case. The long-term yields are more sensitive to the change in expectation of economic growth, inflation and interest rate. In fact, in early 2000 and early 2006, before the Fed stopped the rate hikes, the 2-year and 10-year treasury yields have already declined. That was an early sign of potential recession. Late 2018 just saw the same thing happened, when both treasury yields dropped rapidly. Note that it was despite Fed’s increased rates by a quarter-point in December. Other macroeconomic indicators, especially a declining PMI and a moderating inflation rate, also point to a weakening economy. 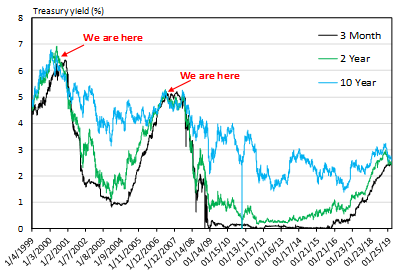 Moreover, we have the most reliable recession signal - the inversion of the 3-month and 10-year treasury yield flashing red on 22 March 2019, the first time since 2007. All of the above warn of an upcoming recession and suggest that the 2-year and 10-year treasury yields are going to drop further. Meanwhile, the yield curve will become more inverted, just like what happened in 2000/2001 and 2006/2007. This is likely to be just the beginning. The downtrend is not going to end until the Fed cuts the interest rate and the economy bounces back. Compared to the previous two recessions, this dive would possibly last much longer, as interest rates right now are at much lower levels and the room for conventional monetary policy (e.g. rate cuts) is limited. From the perspective of hedging the upcoming recession and stock market crash, investors should consider buying treasury bonds now. A low cost way would be through the TLT ETF, which tracks a market-weighted index of debt issued by the US Treasury with remaining maturities of 20 years or more. More aggressive investors could also consider UBT and TMF which provide 2x and 3x exposure.